Eli Manning and company continue their Super Bowl defense as they travel to Washington to play the future of the NFC East — Robert Griffin III and his Redskins. The game has far more in the way of playoff implications than may have seemed likely a month ago. The Giants have dropped two of their last three, and the Redskins have won two in a row, so the lead for the Giants in the NFC East sits at just two games. With a Washington win here the gap would be just a game, and the Redskins have the more favorable schedule the rest of the way. On top of that, the Cowboys are also just two games back, and they face by far the easiest remaining schedule of the three teams. The Giants really need to win to give themselves a good chance of even being able to defend their title. The Redskins, meanwhile, not only need to win to keep in touch with the Giants, but they can stay in the underwhelming NFC wild card hunt with a win. 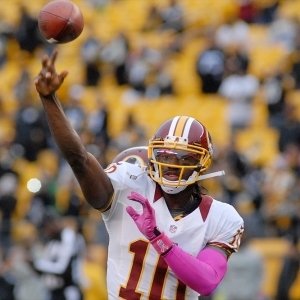 However, the Skins would be in real trouble with a loss. .
You can’t talk about this game without talking about RGIII. Robert Griffin III has had a heck of a rookie year, and the fact that his just became the highest-selling jersey in the league is proof of how much the public loves him and his flashy game. His numbers have been strong — almost 2,500 passing yards, 67 percent completion rate, 16 touchdowns, and just four interceptions. Most impressive, though, is that eight of those 16 scores have come in his last two outings. There are still some issues — he fumbles too much, for instance — but there is little doubt that Griffin is a star and that the team is far ahead of where they would be without him. The question, of course, is whether Griffin can play as well against the Giants as he has the last two weeks against struggling defenses in Philadelphia and Dallas. On one hand, he was very strong in his first and only appearance against the Giants — 20-of-28 (71.4 percent) for 258 yards, two touchdowns and a pick. On the other hand, the Giants totally confounded and perplexed Aaron Rodgers last week, so they are in fine defensive form. One obvious difference between Rodgers and Griffin is mobility. Rodgers was sacked five times, and he was hurried many more times. Griffin was only sacked three times when he faced the Giants, and he managed to rush for 89 yards. His superior mobility gives him a better chance against the confident and talented New York front seven than Rodgers had. How about the other quarterback? I’m not a big Eli Manning fan at the best of times, but it would be hard to argue that this season is the best of times. His completion percentage is the lowest it has been in four years, and his TD-to-Int ratio isn’t as good as it needs to be. Most striking is the difference in his stats when the team wins compares to when they lose. In wins he completes 62 percent of his passes for a yards-per-attempt average of 8.11 yards — very solid. In losses, though, the YPA plummets to an ugly 5.99. More than many teams, then, the fate of the Giants depends on the performance of their quarterback. When handicapping this game, then, the ability of the Redskins to disrupt Manning is a crucial place to look. Last time the teams met, Manning’s passing numbers were solid (26-of-40 for 337 yards) but he was picked off twice and only threw one touchdown. Injuries are, for the most part, no more of a factor here than they are for any team at this point in the season. The one change that is worth some attention, though, is that the Giants have lost running back Andre Brown for the year after he broke his leg last game. He led the team in rushing touchdowns and had scored in each of the last five games, and he was a nice contrast to Ahmad Bradshaw when a more aggressive running approach was needed. With Brown out, rookie David Wilson will fill the role. Whether he can do as well as Brown has lately is an important consideration. The game opened with the Giants favored by 2.5 points. Despite heavy action on the Giants the number hasn’t climbed from that level, and books seem hesitant to move to the key number of three. The total opened at 51 and has been stable at that level. Consistency has been an issue for the Giants — they have gone “under” in their last six games following a game in which they scored 30 or more points. The “over” is 5-1 the last six times the Redskins have been an underdog of three points or less. The Giants are 0-4 ATS the last four times these teams have met. If the line moved to or above three points then I’d have to think about this more seriously, but as it is I’ll take the Giants at less than a field goal. They played very well last week against a strong quarterback, and they have won five of their last seven. I don’t trust Manning, but I trust Washington’s ability to contain him even less. I don’t think it will be a blowout, but the Giants will win.